Honda today completes the reveal of its full 2017 motorcycle line up by unveiling 2 new and 6 extensively upgraded models on the eve of the EICMA show in Milan. The X-ADV is a new breed of motorcycle, that continues Honda’s long tradition of finding innovative ways to create products that enhance and enrich its customers’ lifestyles. It mixes rugged SUV style, off-road appeal and premium specifications, thanks to a tough chassis, long travel suspension, four-piston radial-mount brakes and a torque-laden 745cc twin-cylinder engine driving through Dual Clutch Transmission*. The X-ADV is also equipped with a 5-level adjustable screen, underseat storage space for an off-road style helmet, hand guards, Rally-style instrument display, centre stand, and the Honda Smart Key system. Designed at Honda’s Rome R&D centre, its styling lines capture the essence of two-wheeled freedom in an exciting new form. A year after the introduction of the CRF1000L Africa Twin, Honda’s off-road CRF family is further strengthened for 2017. Every CRF contains the promise of adventure, and the promise of the special experiences that start where the asphalt ends. The dual purpose CRF250L brings that promise within easy reach of every rider. For 2017, it is now both Euro 4 compliant and more powerful thanks to a new throttle body and revised intake and exhaust systems. Its new design draws on that of the pure motocross ‘R’ models, and for 2017 it is also equipped with switchable ABS. The CRF family now has a totally new member, inspired by the CRF450 Rally race machine – the CRF250 Rally, which offers even more off-road performance, with a 10 litre fuel tank, big front brake disk, long travel suspension and high ground clearance. The Dakar styling – together with knuckle guards and the high screen - give great weather protection, making the CRF250 Rally good to go, whether it is round the block or round the world. The 4-cylinder naked CB650F continues the long Honda tradition of stylish middleweights with a highly-tuned balance between engine power and chassis handling. For 2017, it receives a range of updates that make it tougher and sharper, with a more aggressive streetfighter attitude. Also updated for 2017, with more pumped-up Super Sport style, is the CBR650F. Its redesigned fairing improves aerodynamic performance; styling is more aggressive and compact, with an overall look and feel redolent of the new 2017 CBR1000RR Fireblade. Three important members of Honda’s commuter range receive substantial upgrades for 2017. The Vision now benefits from the use of Honda’s eSP – enhanced Smart Power – engine, which improves torque and power throughout the rev range. A bigger floor, repositioned foot pegs and new grab rails improve comfort, while brakes and suspension have also been upgraded. A complete restyling gives the Vision a more contemporary look. The big-wheel, flat-floored SH125i – Europe’s best-selling 125 scooter in 2016** – also adopts the Honda Smart Key system for 2017. A new design and LED head and taillight give an even more sporty, elegant look, and practicality is improved with a charger socket and increased storage space. In addition to these new and upgraded models, several of Honda’s most popular models will be available in new colours. All Honda’s 2017 line-up meet the stringent new Euro 4 regulations, under which the allowable limits for exhaust tailpipe pollutants, such as carbon monoxide, hydrocarbons and nitrous oxide, are approximately half of those for Euro 3. 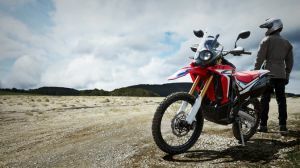 CRF1000L Africa Twin – new Candy Prominence Red colour for Honda’s full size ‘Go Anywhere’ adventure machine, which has sold over 10,000 units since its return to the market in 2016. VFR1200X Crosstourer – new Pearl Glare White and Candy Prominence Red for the luxurious V4-engined adventure sports tourer. VFR800X Crossunner – New Matte Ballistic Black Metallic and Candy Prominence Red for the crossover-styled middleweight with premium specification and V4 power. VFR800F – New Digital Silver Metallic for the original Sports Touring machine. Integra, NC750X and NC750S – All three of Honda’s New Concept series will be available in Candy Prominence Red for 2017. CB500X – New Sword Silver Metallic, Nitric Orange and Candy Rosy Red for the twin cylinder A2 licence-friendly adventure machine. It is also Euro 4 compliant for 2017, as are the CBR500R and CB500F. SH300i – New Matte Pearl White, Lucent Silver Metallic and Pearl Splendor Red for the flagship of the million-selling SH scooter range. SH Mode 125 – New Matte Techno Silver Metallic and Candy Nobel Red for the stylish, lightweight, accessible SH Mode 125. MSX125 and CB125 – two popular commuters are also updated with ABS and CBS brakes respectively for Euro 4 compliance.